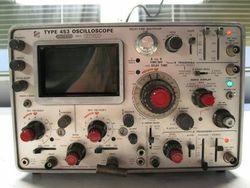 The Tektronix 453 is a portable 50 MHz dual-trace oscilloscope introduced in 1965 and produced until the mid-1970's. The main market driver for the 453 scope was IBM, who wanted a portable scope for Computer Field Engineers to use for working on mainframe computers. In addition, they had a requirement that the scope had to fit under an airline seat, another reason for its size and the front cover. One can even find 453's (and 465's/475's) with "IBM" screened on the front panel by Tek. The 453 also marks the first time that any oscilloscope, (or perhaps any other piece of test equipment), had a lockable dual duty tilt bail carrying handle. Tek held a patent on that feature, as well as on some of the other ergonomics that made up the 400 series. Meets Mil-Std-202B. Will not fail if exposed to 30 g shock test, heavy humidity, ect. The 453 is almost entirely solid-state, even in its first version, except for the 5642 HV rectifiers and CRT. Early 453's (below serial number 20,000) used a few 8393 Nuvistor triode tubes. The 453A, introduced in 1971, was fully transistorized, with extended bandwidth to 60 MHz, increased the graticule from 6 cm × 10 cm to 8 cm × 10 cm, and introduced a mixed-sweep mode. Mixed-sweep mode starts the sweep at the "A" time/div rate and then, after a delay set by a ten-turn vernier dial, continues at the "B" sweep time/div rate. There are two trigger/sweep units in a 453, thereby enabling delayed sweep mode. There are two delayed sweep modes: "B runs after A" and "B triggerable after A". The A and the B sweep triggering both use tunnel diodes, with a trigger preamplifier preceding the actual trigger circuit. The use of tunnel (Esaki) diodes gave the 453 triggering that is stable and useful to twice the oscilloscope's bandwidth. The vertical amplifier that drives the CRT (T4533) deflection plates is a cascoded differential amplifier made of NPN transistors. Each horizontal deflection plate is driven by a common-emitter amplifier with feedback. The total CRT acceleration is 10 kV. The CRT cathode voltage is -2 kV and the CRT anode voltage is +8 kV. A Tektronix 453 consumes 100 W power and weighs 29 pounds (13.2 kg). Part of the heft of this scope is due to its very sturdy aluminum frame and covers. The 453 came with a rigid metal front panel cover with locking latches that protected the scope while it is in transit. This cover has a compartment for storing probes and accessories. Inside the 453, the electronics are rather densely packed in order for the scope to be compact. The top and bottom cover of the case separate easily using an ingenious thumb screw locking system - truly the only scope series that could be opened for service/calibration in a few seconds. Removing the rear cover exposes the remaining fuses and circuitry that rarely required access. With the Mod 127C, and Internal TV Sync Separator circuit permits stable internal line or Field-rate triggering from displayed composite video or composite sync waveforms. External /10 trigger sources are replaced by Internal TV Sync positions providing Line sync pulses to the B Sweep circuit and either Field or Line sync pulses to the A sweep circuit. The Tektronix 453 has a thin bright trace. This page was last edited on 5 April 2019, at 17:13.